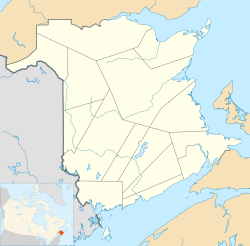 "City of Stately Elms", "The Celestial City", "Freddy Beach"
Frederiction is the capital city of New Brunswick, Canada. It is filled with rich history. Fredericton is on the Saint John River. There is a playhouse. There are scenic walking trails. Frederiction is the capital of New Brunswick. The population of Fredericton was 1,886 at the 2011 census. Fredericton is known as a cultural and artistic city in New Brunswick. The city hosts an annual Harvest Jazz & Blues Festival which attracts both regional as well as international jazz, blues, rock, and world musicians. ↑ "History of Fredericton". Fredericton. Retrieved 2015-01-09. ↑ "Churches/Places of Worship". Fredericton. Retrieved 2015-01-09. ↑ "Coat of Arms". Fredericton. Retrieved 2015-01-09. ↑ "Mayor and Council". Fredericton. Retrieved 2015-01-09. ↑ "Population". Statistics Canada. Retrieved 2015-01-09. ↑ "Harvest Jazz & Blues Festival". Harvest Jazz & Blues Festival. Retrieved 2015-01-09. This page was last changed on 3 February 2019, at 18:16.